Once the Eastern Province, comprising Batticaloa, Ampara and Trincomalee (BAT), was wrested control of, the next major target was Mulativu in the Northern Province. But, the Mannar district in the west and Vavuniya north provided the buffer making Mulativu inaccessible. The districts of Mulativu and Mannar overlap at the boundary. To the west of the Giant’s Tank in the Mannar District, are many small tanks and lush paddy cultivation, while to the east, fewer tanks in the scrub jungle. North east of the Giant’s Tank is the dense Madhu jungles. 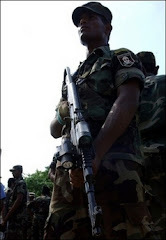 Through the Madhu jungles, the security forces could penetrate one of the LTTE Forward Defence Lines (FDL) running from Vidalthivu on the western coast to Pulliyakulam, north of Omanthai on the A-9 Road from Vavuniya to Jaffna. The LTTE controls this road from Omanthai to Muhamalai, running through the districts of Vavuniya, Mulativu and Jaffna. To the south of the Madhu jungle, is the sanctuary of Madhu Matha. Throughout the year, there are several feasts celebrated there, but the August one draws lakhs of Catholics from the North and South. Madhu is the meeting point for Tamil Catholics from the North and Sinhalese Catholics from the South, even as Kataragama is the converging point of Hindus from the North and Buddhists from the rest of the country. The military, which tried the previous eastern approach to penetrate the jungles in the Wanni, in small numbers, were not all that successful. As we forewarned, it was not going to be a cake walk, given that the Tigers were well entrenched and dug in, to prevent further inroads into their main territory. For months, the military tried to penetrate places such as Thirukethiswaram and Andankulam west of Giant’s Tank and to the east of this tank, areas such as Vilattikulam, Pokkaravanni, Iranai Illuppaikkulam, Periyathampanai and Thampanai, to no avail. A separate 57 strike Division was created for the purpose. Teams stealthily entered north of the Madhu jungles at Periyamadu and Palampiddi but did not make much progress. The government tried to explain its attempts to wrest control of Madhu by citing the request of Vatican Secretary Cardinal Tarcisco Bertone to allow pilgrims to visit the holy shrine. The request was made on the sidelines of an audience President Mahinda Rajapaksa had with Pope Benedict XVI in April this year. The President maintained that it was beyond government mandate, as long as the LTTE controlled Madhu. The army controls the A-14 Road from Medawachchiya to Mannar and the Navy controls the area beyond Mannar-Mannar Island including Tallaimanar. On the A-14, there are three important points - the turn off on the Madhu Road, closed since August 2006, by the army on the one side and the LTTE on the other, after a stretch of no-man’s land. For the August feast this year, the military allowed civilians to use the Uliyankulam Entry/Exit point to enter Madhu. But this point has been closed, as operations are now taking place in the extreme west of the Wanni. On account of the closure, aid workers don’t have access to the Musali Division and those based in Mannar are unable to access the increasingly large caseload in Manthai West Division. At Thallady, where the A-14 and the A-32, which is the road to Pooneryn, meet, is a large army detachment. As several efforts to penetrate west of Giant’s Tank failed, the government decided to capture areas behind the enemy lines north of the current Madhu jungles. This is to make the entrenched impregnable places south, redundant, as supplies and reinforcements would get automatically cut off, forcing the LTTE to withdraw its beleaguered cadres. This tactic referred to as ‘bypassing the enemy line behind it,’ was also used in Operation Jayasikuru. Hence, the military thrust was to secure places such as Adampan, Palampiddi and extending it up to Puliyankulam, by moving east from here and north from Omanthai. The FDL crossing at Omanthai closed from November 29, for civilians moving from the Wanni into government controlled areas, was reopened on Thursday (6). A few weeks back, under pressure, the LTTE deserted Vietnam Base at Mullipallam, which was one of the main supply bases for the Wanni FDL. The LTTE had launched operations from Vietnam Base, to prevent the military from wresting control of Madhu. At Adampan, in the Mannar District, a predominantly Catholic area, December 1 dawned to the sound of gunfire. Troops broke out of their FDLs at the crack of dawn, with the intent of wresting control of Adampan, which had been under Tiger control from the nineties. Adampan is situated in the Manthai West Division. Troops met with heavy resistance, as the first round of fighting lasted two and a half hours. This was one of the fiercest battles since Wanni operations began. Nine Tigers were killed and four dozens wounded, according to the military, which admitted three killed in action (kia) and 10 wounded in action (wia). Troops for this operation were drawn from 8 Sri Lanka Sinha Regiment (SLSR) commanded by Lt. Col. Ramesh Fernando, 2 Commando Regiment commanded by Maj. D.M.J. Balasuriya and 3 Commando Regiment under Lt. Col. Uditha Bandara. The operation was commanded by Task Force 01 under Brig. Shavindra Silva. Fearing that the security forces would proceed north from Adampan, to take control of Vidattaltivu, where the LTTE FDL begins on the extreme west, cadres from the Charles Anthony Brigade hit back several times in a bid to retake Adampan. There were three retaliatory strikes on Sunday and Monday. The military claims 35 Tigers and six soldiers died in the retaliatory strikes to retake Adampan. Another two dozen soldiers were wounded as troops held on to newly secured territory, now being consolidated. On Saturday (01) evening, 57 Divisional Commander Brig. Jagath Dias launched another operation east of Vavuniya to secure Periyapandirichchan, which had been under LTTE control from the late nineties. Troops from the 7 Sri Lanka Light Infantry (SLLI) commanded by Col. U.R. Abeyratne were drawn for the operation. On account of the operations in Vavuniya and Mannar, 3,071 families (10,302 persons) and 6,328 families (23,662 persons) respectively, have been displaced from the districts. It was likely that a fresh front would be opened up in Weli Oya, now that the 59 Division, including a Deputy General Officer Commanding and three brigade commands have been established, as reported several weeks back in this column. It was probably to prevent operations in Weli Oya, that the LTTE launched the Kebithigollewa claymore blast as a diversionary attack to make its present felt. Fifteen people died in the blast that hit the bus heading for Janakapura from Medawachchiya. New procedures have been implemented at the Medawachchiya checkpoint, including vehicle checks and registration of even UN vehicles. In protest, the NGO Consortium in Vavuniya and local NGOs there, as well as in Mannar, held a one-day strike on Wednesday (05), to draw attention to the threats humanitarian workers were facing. The work of humanitarian workers in a war situation must be appreciated not just on Human Rights Day tomorrow, but always.